Mobile devices were initially developed as portable devices that could be carried anywhere. Mobile phones had the function of calling facility and sending short messages. These days the mobile devices include a variety of handheld devices which have a lot of smart functions and applications, apart from basic facilities, these devices have common features- technical and specifications, but may differ in the platform used by the manufacturers of these devices. The range of the mobile manufacturers is wide and is growing in number with the rising demand in the mobile device markets. Mobile devices consist of the various forms of handheld devices- Cell phones, tablets, portable computers, watches, etc. Innovation is dynamic and increasing and new devices are being developed. The one thing that remains constant in demand is the software platform to run the devices and application software. The Manufacturers either use the self created platforms or outsourced to create the platforms friendly with their hardware or what is available in the market. Nokia e.g. used the Symbian operating system earlier and then switched to windows and android platform. Though the demand in the market may change-the type of device or hardware, the application software demand always rises as new manufacturers, innovations emerge. This demand of devices demands of the new and innovative software applications. 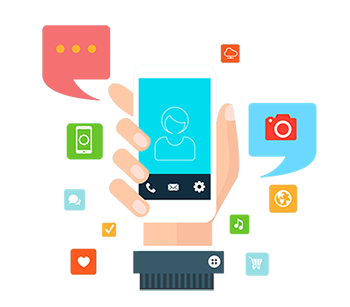 Mobile Programming constitutes the knowledge of the platform and developing new application software that run on the platforms. The application software is either pre-installed by the manufacturer or is available in the platform’s application market from where the user can buy and download or download for free. The mobile application development requires the programming skills and innovative mind. While developing the applications the programmer has to consider both the platform and hardware specification because the devices differ – operating system, screen sizes, processing specifications, screen resolution, other configurations and requirement and other software/hardware dependence. Front end- The User Interface through which the user communicates the input with the device and the device communicates back the output. Middle part- this consists of the processing part of the input information, usually hidden or abstracted from the user. Back end- the storing of the processed information using the memory of the device. The information is retrieved or stored and restored after editing or changes. Fast and responsive- users require the applications those are efficient in use and do not take time to response. Applications should support key features of the device and the platform. E.g. the GPS is used by many applications for the location access and ease of providing results. Should follow the pathway of communication with the application platform and hardware e.g. few applications are not allowed to run when battery power of device falls. Should be user friendly- applications are used by majority of non-technical users so they should be able to learn and use the application quickly providing tutorials for first use. User bugs should be communicated to the developer and instant solution be provided. Mobile programming is a wide term. Mostly the application development is Platform based programming making it narrower skills based on platform development.